The following piece is written by Cory Bender and Wade Kusack. Cory Bender is the Program Officer for Eurasia at the Institute for Global Engagement. Wade Kusack is the President at LYN Community. Ukraine has created a crisis for the Kremlin, or at least that’s what a string of recent op-eds has claimed. Whether it’s economic malaise, fissures in Putin’s inner circle, or the possibility of democratic revolution, analysts are eagerly searching for chinks in Putin’s armor. 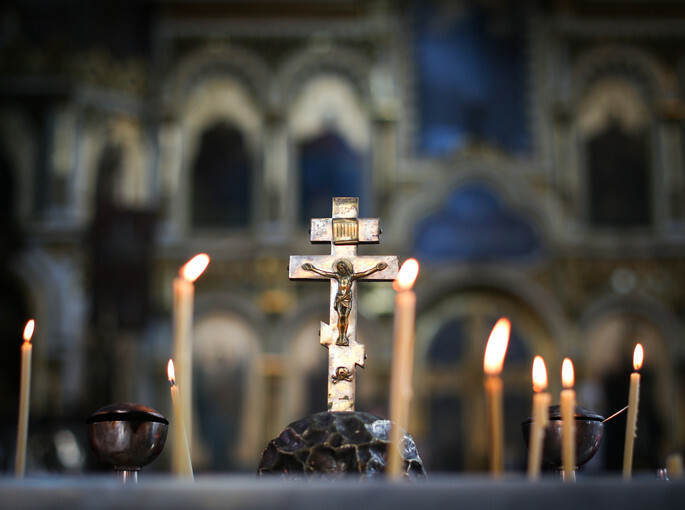 Less discussed, however, has been a slow-burning crisis in the Russian Orthodox Church (ROC). The ROC has its cameos in Western news coverage of Ukraine. The “Orthodox Army” ravaging the Donbass and molesting religious minorities, in particular, has drawn some attention. But it would be wrong to assume that the Kremlin, or even the Moscow Patriarchate (the leadership of the Russian Orthodox Church), are directly responsible for these atrocities. Mostly to blame are Russian Orthodox zealots motivated by religion rather than instructions from Moscow. Moreover, these freelancing faithful are creating serious problems for the Russian Orthodox Church, and if it can’t rein them in, the church could become dangerously divided. These zealots—whom some scholars have branded “Nationalist Orthodox”—claim to be loyal to the Russian Orthodox Church. At the same time, however, they view the Church leadership in Moscow as traitors. They derisively call them “Nikodimovtsy,” after Metropolitan Nikodim, whom they vilify for his conciliatory stance towards other branches of Christianity. The Nikodimovtsy, according to the Nationalist Orthodox, include many of the ranking bishops of the Russian Orthodox Church—and Patriarch Kirill himself. The Nationalist Orthodox share many of the same assumptions as more moderate Russian Orthodox. They both see Moscow as the Third Rome—an idea stretching back centuries that posits Russia as the last bastion of true Christianity. On this view, Western liberalism is the primary threat to Russian statehood today, and as such Russia must be protected from Western proselytism—whether it be religious proselytism by Protestants, or human rights proselytism by the State Department. But the Nationalist Orthodox take this to an extreme. While the Moscow Patriarchate noisily opposes what it sees as Western attempts to subvert Orthodox Russia, it accepts that Russia must coexist with the West. Nationalist Orthodox, on the other hand, see the West through the lens of New World Order conspiracies: as a stew of international Jewry, Wall Street banks, imperialistic military and political forces, and demonic religious movements. For them, Russia cannot coexist with the West; one or the other must be annihilated. This violent fanaticism of the Nationalist Orthodox faction has put the Russian Orthodox officialdom in a bind. The Russian Orthodox affiliate in Ukraine, called the Ukrainian Orthodox Church – Moscow Patriarchate (UOC-MP), is hardly able to balance its affiliation with Moscow and its Ukrainian congregants’ patriotism. This has led to speculation that the UOC-MP may seek to break its ties with Moscow; already, dozens of churches have left the UOC-MP to move to its Kiev-affiliated sister church. But the Russian Orthodox Church’s problems aren’t limited to Ukraine: the divide between Orthodox officialdom and militant nationalists is emerging in Russia as well. Aware of this, the Kremlin is trying to assert control over nationalist fringe fighters. It sacked the swashbuckling Igor Strelkov, a key leader of the Nationalist Orthodox fighters in Ukraine, and may have even assassinatedother separatist leaders that were too hot to handle. More ominously, Russian border guards are reported to have killed hundreds of retreating separatist fighters rather than allowing them to enter Russia. But the root of the problem facing Russia and the Moscow Patriarchate is not a few firebrands, but rather the ideological poison of religious nationalism itself. This ideology survives on generalized hatred of the West and its values, while doing little to define a positive identity and a path forward. The Kremlin and the Orthodox Church themselves have stoked this fire, and now it is burning out of their control. The (potentially) good news for Russia is that this nationalism is still changing. If Russian leaders could divert the flood of patriotic fervor into positive channels, it could stem the tide of militancy, and possibly even help to lift Russia out of its social and economic rut. The ROC would have to play an important and courageous role in any such effort. Given current trends within the Church, however, the prospects for this look dim. Priests that preach reconciliation are marginalized, while Nationalist Orthodox are promoted. The Moscow Patriarchate, for its part, sees all of this as a kind of balancing act: not wanting to buckle under the pressure of ultraconservatives, while not wanting to run afoul of the Kremlin. This balancing act will probably fail. And when it does, the Church, like so many in eastern Ukraine, may find itself hostage to extremists.